North Korea on Monday marked the 107th anniversary of the birth of its founder Kim Il Sung with no outward provocation against the United States despite the collapse of their second denuclearization summit in late February. The anniversary, known in the country as the "Day of the Sun," is a major holiday. National flags and placards have been placed along major streets of Pyongyang in celebration of the birthday of the founder, who died in 1994. The commemoration came a few days after Kim Jong Un, grandson of Kim Il Sung, was re-elected at the nation's top legislature as supreme leader and expressed eagerness to hold a third summit with U.S. President Donald Trump in his policy speech at the parliament. 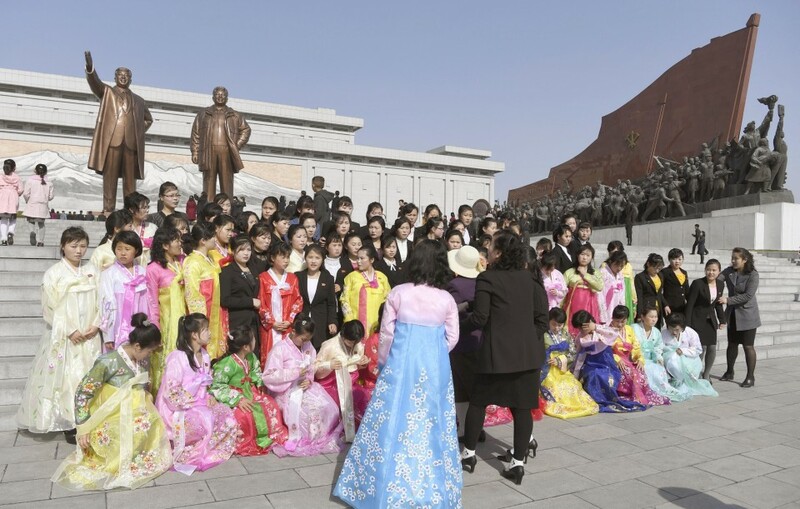 As on past anniversaries, citizens and military personnel laid flowers and bowed before giant statues of the founder and his son Kim Jong Il, the previous leader who died in 2011, on Mansu Hill in the heart of Pyongyang from early morning. Plenty of "Kimilsungia," a purple flower of the orchid family named after Kim Il Sung, were on display in hotel lobbies and other places. The flower was created in Indonesia. At an annual exhibition featuring around 26,000 roots of the purple flower, there were no replicas of satellite-carrying rockets or missiles on display, unlike on previous anniversaries. North Korea has held a series of sports and cultural events over the last few days. On April 7, more than 1,000 foreigners from about 40 countries including Japan, Germany and Russia participated in a Pyongyang marathon organized for the commemoration. In the nation's capital, an exhibition of stamps honoring the achievements of Kim Il Sung was also held. As North Korea's economy is believed to have been hit hard by international economic sanctions aimed at preventing the country from developing nuclear weapons and ballistic missiles, many political slogans in Pyongyang have promoted "self-reliance." At their Feb. 27-28 summit in Hanoi, the U.S. and North Korean leaders fell short of bridging the gap between Washington's denuclearization demands and Pyongyang's calls for sanctions relief. Kim, who has recently pledged to build a "powerful socialist economy," asked the United States to ease economic sanctions, arguing it has already started to implement concrete measures toward denuclearizing the Korean Peninsula. In his speech on Friday, Kim said that if there is written consent "favorable for the interests of both sides and acceptable to each other," he will sign an agreement with the United States without reservation, the state-run Korean Central News Agency reported.